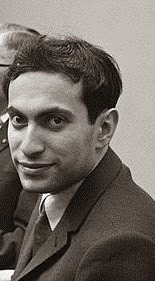 Mikhail Tal would have been 77 years old on November 9th. 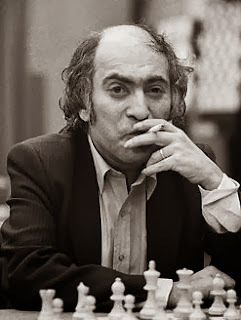 Perhaps if he'd smoked fewer cigarettes, he'd have been around to join us as we observe his birthday with a four-round, all-ages, USCF-rated tournament in DeKalb. Off in Russia they hold a big Tal Memorial event in November, so we've decided to call ours "The OTHER Tal Memorial" in order to avoid confusion. We'd hate to have some geographically-challenged GM show up at our event. In what should feature three sections, this will be the perfect warm up for players entering the ICA's 2013 All Grade which is being held the following weekend in Normal at the Bone Center on the campus of Illinois State University, NIU's cousin to the south. It's also the perfect follow up to the 2013 Polgar World Open to be held November 2 and 3. Young chess players thrive when playing beyond mere scholastic events, giving their game well-rounded perspective. According to Tal's first wife, the six-time Soviet Champion "was so ill-equipped for living... When he traveled to a tournament, he couldn't pack his own suitcase... He didn't even know how to turn on the gas for cooking." Thus Tal joins a long line of chess players who were entirely dysfunctional away from the board! Tal loved the game in itself and considered that "Chess, first of all, is Art." ... Known as "The Magician from Riga"... Tal was the archetype of the attacking player, developing an extremely powerful and imaginative style of play.... He often sacrificed material in search of the initiative... " Although his playing style at first was scorned by some as nothing more than "tricks", Tal convincingly beat virtually every notable GM with his trademark aggression." Naturally artistic, witty and impulsive, Tal led a bohemian life of chess playing, heavy drinking and chain smoking, which on more than one occasion created an embarrassment for the Soviet authorities. From 1950 (when he won the Latvian junior championship) to 1991, Tal won or tied for first in 68 tournaments. During his 41-year career he played about 2,700 tournament or match games, winning over 65% of them. Despite a congenital hand deformity, Tal was also a skilled piano player. If you're interested in learning more about "The Magician from Riga" you're welcome to check out this write-up of a Russian radio broadcast where Garry Kasparov was interviewed about his "Great Predecessor" Tal. This transcript was posted on Chess.com in 2008. So come on out to DeKalb on November 9 and show us your own best attacking game. Early registration discounts available through Thursday, November 7. Sorry, no smoking on church grounds, but there is a cemetery nearby if you can't resist the urge to light up! Have one for "Misha".